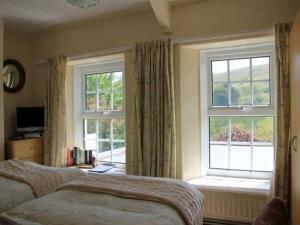 Ffynnon Cadno Bed & BreakfastA warm welcome awaits you at Ffynnon Cadno. Located in the foothills of the Cambrian Mountains close to Devils Bridge and Aberystwyth, a perfect place to explore Mid Wales. Red kites guaranteed, ideal for mountain biking at Nantyrarian, fishing, walking or bird watching. The 3 acre garden has several ponds, mature gardens and a beech wood. 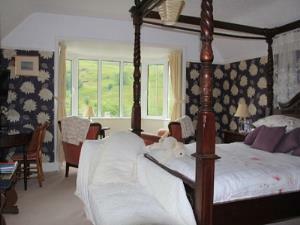 Twin bedded room with views over Valley to hills and beyond. A great welcome by the hosts, who offered us a cup of tea on arrival. We got a lot of information about local area. Location is very local to Aberystwyth Devils Bridge, but also slightly longer day trip to Elan Valley and I am sure other places. The property is next to the A44 the main road, but it did not disturb us.